Be honest: When you look in the mirror, how do you feel about your smile? Recently, the American Association of Orthodontists commissioned a study that shows over a third of American adults feel unsatisfied with the appearance of their smiles. Fortunately, cosmetic dentistry can correct many common esthetic issues. Dr. Adrian J. Vande Merwe offers our patients access to the latest innovations in cosmetic dentistry. Answer: Cosmetic dentistry is any procedure, whether conservative or extensive, designed to improve the appearance of a patient’s teeth and gums. Cosmetic dentistry may be employed to erase teeth stains, correct misalignment, or repair a damaged or misshapen tooth. The cosmetic technique Dr. Adrian recommends will depend on a number of factors, such as your dental health and the extent of your esthetic issues. Question: Can esthetic issues actually hurt my smile? Answer: In many cases, the same factors that hurt the appearance of your smile could be a sign of a developing dental health problem. For example, teeth stains are often indicators of plaque buildup, which can weaken outer enamel (increasing the odds of a cavity forming) or inflame the gums (leading to gingivitis and sometimes even gum disease). In addition, misalignment provides a number of hiding places for harmful oral bacteria, which boosts the odds of developing dental disease. Question: What cosmetic treatments does Dr. Adrian offer? Answer: Dr. Adrian offers Bountiful residents a number of cosmetic options. 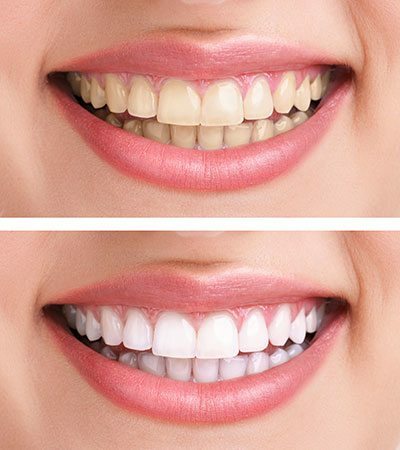 Our teeth whitening systems allow our team to offer both in-office and at-home options for your convenience. Porcelain veneers allow Dr. Adrian to place custom-made shells of porcelain onto the front teeth, completely rejuvenating your smile in a single procedure. Finally, our all-porcelain crowns can protect and preserving your tooth structure while transforming the appearance of your tooth. Question: How can I keep my smile beautiful from home? Answer: Along with our cosmetic treatments, we always recommend good preventive dentistry. With a few simple steps, you can help your smile stay bright and beautiful from home. Each day, you should brush your teeth twice and floss once. With simple brushing and flossing, you reduce the appearance of teeth stains and keep your smile healthy. Do you have any questions about cosmetic dentistry? Interested in improving both the health and beauty of your smile? Then schedule a visit with Dr. Adrian today. We proudly service the residents of Bountiful and surrounding communities.Call us today at (801) 292-7500.